Aganze Nkere is fast. As in, fastest time ever run by a Christendom athlete fast. 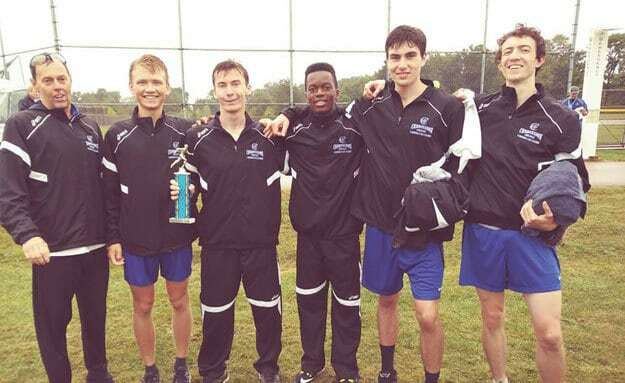 Nkere is a freshman at Christendom, and is already making a statement on the college's cross-country team. Before arriving, however, Nkere garnered interest from other colleges, but turned them down to come to Christendom. He believes that, by attending Christendom, he will gain the knowledge needed to change the world. Nkere is the second member of his family to come to Christendom, following in the footsteps of his sister, Nehema. Thanks to her, he decided to attend the Experience Christendom Summer Program during high school, spending the week learning, socializing, and breathing in the education and culture that sets Christendom apart from other schools. He fell in love with the curriculum, the activities, and the prominence of Catholicism on campus, but held off on his final college decision until later. A gifted runner, Nkere won the conference championship in cross-country with his high school, Loyola Blakefield. That achievement got the attention of other colleges, including Johns Hopkins and Mount St. Mary's. Being able to compete in more well-established cross-country programs (Christendom's is only a few years old) was enticing. But, Nkere wanted more from his college experience than just athletics. "I wish to grow mentally, spiritually, and socially," says Nkere. "At Christendom, I can grow mentally by enrolling in challenging courses taught by great professors who are invested in their students. I can grow spiritually by strengthening my faith and relationship with God, which is at the core of Christendom's beliefs. And, I can grow socially by immersing myself in as many clubs and activities as I can, meeting new friends in the process who allow me to express myself and feel welcome and accepted in the community." Nkere with the Crusader cross-country team, after taking 3rd as a team at the Westmoreland Invitational — the first trophy for cross-country in college history. Nkere eventually applied and was accepted to Christendom, and is now thriving in the community. In the classroom, he is just as invested in the courses as he was at the summer program. Outside of it, he is achieving greatness as a cross-country runner. At the Bridgewater Invitational, Nkere ran a 17:58 5k, placing 10th overall out of 47 runners. He followed that with an 18:14 in the pouring rain at the Westmoreland Invitational, placing 9th. As a Christendom athlete, Nkere is getting the best of both worlds — a chance to compete and help form Christendom's cross-country team, while also getting the Christendom liberal arts education, something that will set him up for his future, and give him the best opportunity to go out into the world and restore all things in Christ. Nkere wants to change the world, and he's already sprinting toward that goal.